Like many, when I think of Italy, I think of fashion (and pasta;))! With the countdown on to my upcoming trip to Italy and eagerly anticipated journey to the Florence outlets, this whimsical fashion editorial from Vogue Italia seems fitting. 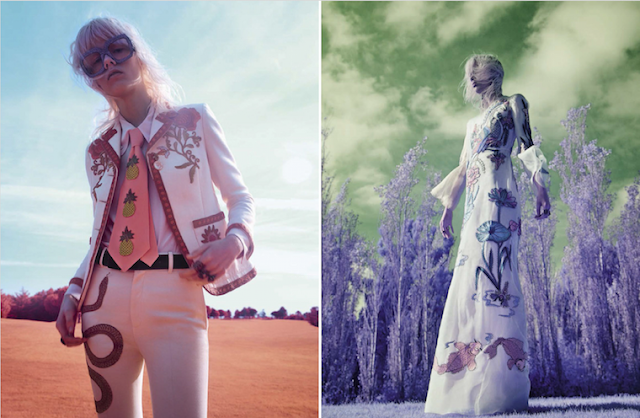 In the editorial "So Cool,"photographer Solve Sundsbo created a surreal hypercolor landscape to compliment the uber feminine yet modern looks by Gucci which were by Patti Wilson on model Marjan Jonkman. Color, rich fabrics, pattern and unabashed flair are seen throughout the feature - all trademarks of classic Italian style.